Figure 3. Fuel Priming Pump. Figure 2. Fuel Supply and Return Valves. Install inside nut (Figure 3, Item 6) on new priming pump body (Figure 3, Item 7). Position new priming pump body (Figure 3, Item 7) through bracket (Figure 3, Item 5). Install outside nut (Figure 3, Item 6) on priming pump body (Figure 3, Item 7). Tighten nuts (Figure 3, Item 6). Install new priming pump (Figure 3, Item 4) in priming pump body (Figure 3, Item 7). Tighten nut (Figure 3, Item 3) on priming pump body (Figure 3, Item 7). Wrap fittings (Figure 3, Item 1) and (Figure 3, Item 9) threads with antiseizing tape. Install fittings (Figure 3, Item 1) and (Figure 3, Item 9) on priming pump body (Figure 3, Item 7). Tighten fuel lines (Figure 3, Item 2) and (Figure 3, Item 8). Remove LO/TO from A3 breaker switch. Refer to FM 4-01.502 for LO/TO procedure. Prime fuel system (WP 0078). 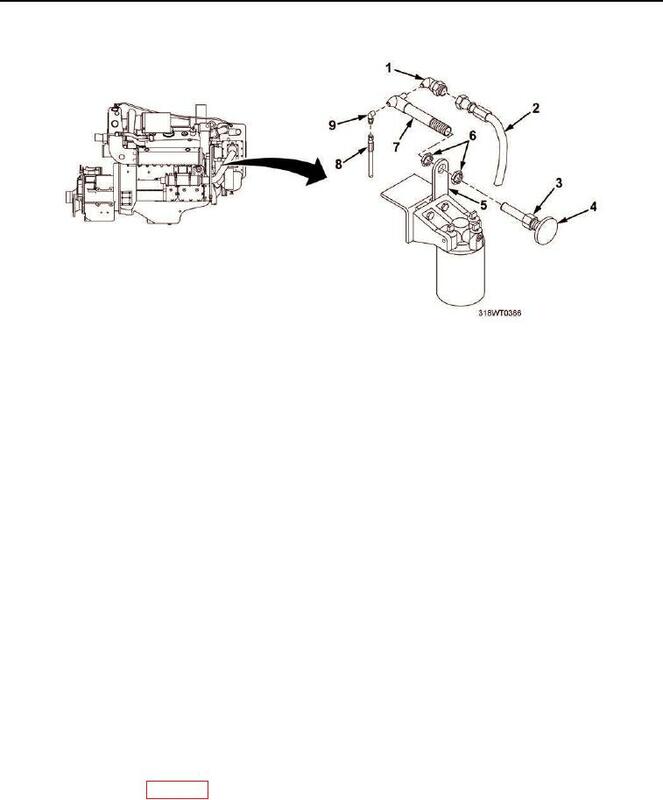 Check connections on priming pump body (Figure 3, Item 7) for leaks. Shut engine down (TM 55-1925-205-10).